An All Natural, Award Winning Relief for the Common Cold Has Arrived! Tis’ the season for sore throats! With the seasons changing and the cold weather approaching, we at Pacific Resources International have important things on our mind. One of those things is the scary side effects of cough medicine. We wanted to find an all natural relief for the common cold using the healing properties of Manuka Honey and Bee Propolis. 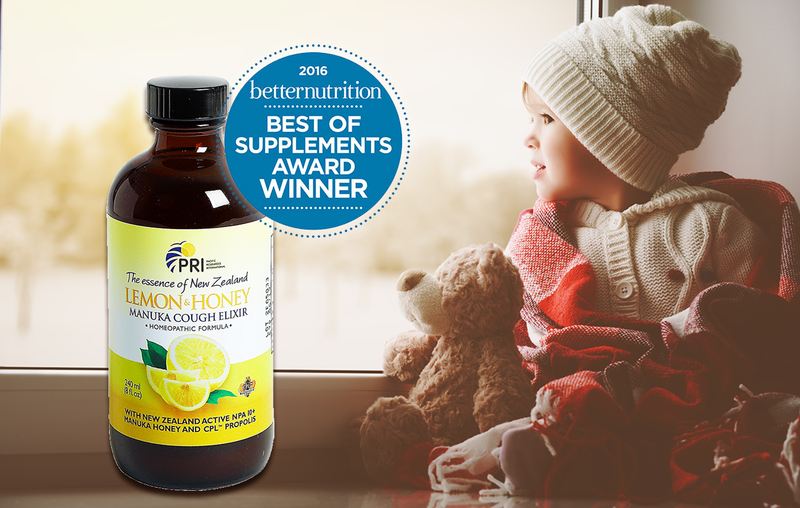 We are proud to announce that our Lemon and Honey Cough Elixir was awarded the 2016 Best of Supplements Winner from the Better Nutrition Magazine! Our Cough Elixir uses a unique homeopathic formula with the active ingredient Bryonia, New Zealand bee propolis which is high in Bioflavanoids, and Manuka Honey that is specifically formulated to relieve symptoms of a dry cough. Why choose PRI’s Lemon and Honey Cough Elixir over regular cough syrup? We believe that in order to heal your body, you need all natural ingredients. An all natural cold relief that’s perfect for kids! Soothing honey and yummy flavors make relieving a scratchy throat that much easier. This season, keep your kids feeling 100% with our award winning Children’s Lemon Honey Cough Elixir or our Children’s Strawberry Cough Elixir! Next Our Brand New Lip Balm Has Arrived!